Currently we have a large staff strength of compassionate healthcare professionals and a continuously growing client base. We are well on our way to accomplishing our stated goals, which is: To bring better home health care to our community. Private Pay Clients of all ages. Apply today if you are a RN, LPN or a CNA and looking for employment in the Cincinnati area. Need to know more about the nurse you are welcoming into your home? We can help. We know nursing. We offer consulting services to help you best establish your patient care. 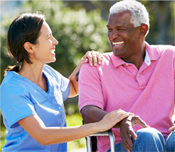 Our qualified staff of nurses can help your and your loved ones with in home care. 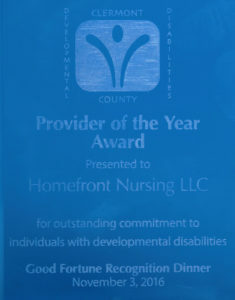 Homefront Nursing received the prestigious Butler County Board of Developmental Disability Agency Provider Of The Year 2015. This award ceremony took place at their 21st Annual Community Recognition Dinner. 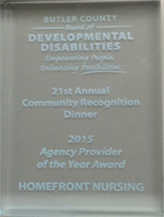 Congratulations to the team for going above and beyond in caring for individuals with developmental disabilities in Ohio. Looking for a career as a caregiver? Homefront Nursing Agency specializes in providing contract and per-diem nurses (RN’s – All Specialties, LPN’s and CNA’s), to Cincinnati area hospitals, nursing homes, medical centers, and a variety of other healthcare facilities.